Hello, i've just installed the free bsplayer from this site. I've never had any problems with it until now. even adsense was safe and not really slowing my computer down. This versions does not have adsense or whatever advertising programm it's associated with. however my zonealarm firewall warned me the programm attempted to monitor my keystrokes, mouseclicks and even KIS (kaspersky virusscan) detected keylogger activity from the programm. altough no trojan of any kind has been found withing the installation file, nor on my computer after installation...the keylogger activity remains. BS.Player does not have ANY malware included in it. Could you give any evidence of this reports? Log files, screenshots, anything? Also, please, give us BS.Player version you are using, URL of the site you downloaded it from. The problem could be caused by BS.Player using multimedia buttons on your keyboard, but not very likely; also this could be false detection, we will investigate further as soon as we receive additional data from you. tHanX we will take a look. The cause for this alert is BS.Players global support for keyboard multimedia keys. BS.Player installs WH_SHELL hook to receive HSHELL_APPCOMMAND messages and detects when multimedia keys are pressed. ZoneAlarm detects this and shows security alert. You can verify this if you uncheck 'Enable global support for multimedia keys' option and restart BS.Player. Now ZoneAlarm won't show any alerts. If you re-check this option warning will be shown again. It's nothing to worry about. It's recommended to leave it enabled, so multimedia keys will work even if BS.Player window is not active (ie. in background). 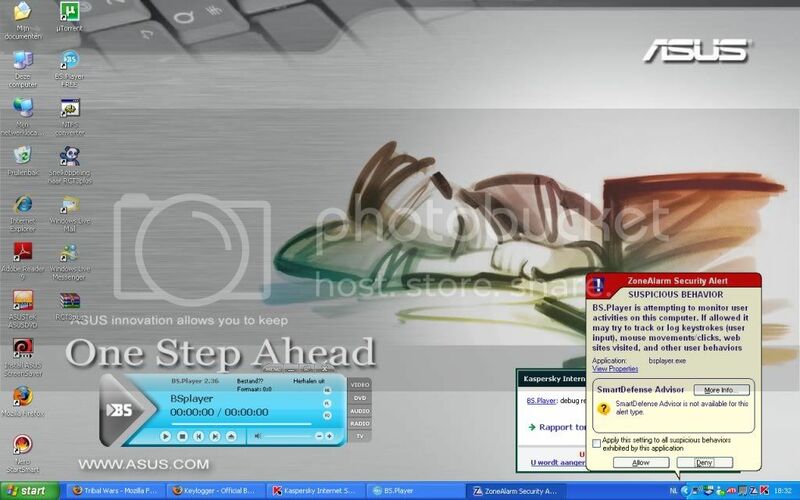 Originally Posted by Koen T.
altough no trojan of any kind has been found withing the installation file, nor on my computer after installation...the myjad keylogger activity remains. Check your outgoing connections and see if any data is being sent to a unknown source. If so you can easily block the connection or you can try and find where the logger is hiding on your computer and attempt to remove keylogger by yourself. If unable to find try and find some sort of anti-virus to run a system scan to help look more thoroughly. Last edited by quickercarter; 12th September 2013 at 08:57 AM.